Also read: Take our 6 question test to find out which type of lawn mower is best for you and some tips on buying a new lawn mower. According to the Environmental Protection Agency, gas mowers cause 5% of the nation's air pollution*. 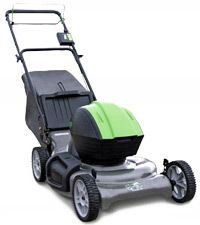 Trade in your old gas mower for a rechargeable cordless electric lawn mower. You'll save time and money—and help the environment. Compared with cars, gasoline-powered lawn mowers produce a disproportionate amount of air pollution. Mowing your lawn for one hour with a conventional gas lawn mower can cause more air pollution than driving from Madison to Chicago and back in a new car. Federal regulations aimed at reducing smog-producing mower emissions have made today's gas-powered mowers cleaner than old ones--something to consider if you're now using an older gas powered mower. However, the new cordless models only use as much electricity as an ordinary toaster. The only pollution generated is from that used to generate the electricity at the power plant which is supposedly better equipped to handle pollution issues that the average homeowner and the recycling problems associated with worn out batteries used in cordless mowers. Perhaps the best feature of these new cordless mowers is their minimal environmental impact during operation. Even after accounting for power-plant emissions, replacing gas mowers with electrics results in a 99% reduction in carbon monoxide, hydrocarbons, nitrogen oxides, and methane, and a 38% reduction in carbon dioxide. Have you ever felt a twinge of guilt when your gasoline-powered mower first roars -- those of us with nearby neighbors have. Or have you waited until you knew your neighbors were up and about before mowing the lawn? Gas mowers run at some 90 decibels (ear-protectors are recommended for operators-- normal conversation about 75 decibels). Electric mowers, operating in the 65 - 85 decibel range, make being a thoughtful neighbor a whole lot easier. Although the typical lawn won't pose any problems for these mowers, assess your situation before investing. Cordless electric mowers are best for flat lawns smaller than 8,000 square feet and composed of cool-season grasses such as Kentucky bluegrass, fine and tall fescues, and perennial ryegrasses. Warm season grasses such as St. Augustine or Zoysiagrass may create too much resistance to make the cordless mower feasible or you may have to mow it at higher than normal and keep a spare battery charged up. Because of their overall weight, including batteries, These mowers are often hard to push up sloping lawns. Although they're not that heavy in comparison to standard mowers, cordless models are not usually self-propelled. Electric mowers eliminate the cost of oil changes, spark plugs, air filters and annual tune-ups. 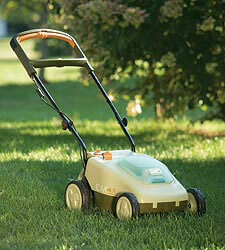 Electric mowers use about $5 worth of electricity each year for an average size yard. Beyond replacing the battery every 5 - 7 years, periodic cleaning, and blade sharpening, there�s little maintenance. 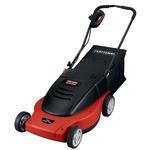 Cordless mowers generally come with one to three 12-volt, lead-acid batteries (12-, 24-, and 36-volt models). The two Lawnboy cordless electric mowers have 6-volt batteries. But the actual voltage (or power) delivered to the motor depends on amperage. For example, a 12-volt mower with high amperage can mow longer than a 36-volt mower with low amps. Power is a function of battery type, blade and deck design, and power transfer. All manufacturers exploit computer-aided design techniques to optimize blades' weight and shape and decks' contours. Toro and Black & Decker claim that their cordless mowers have more torque than a 5-horsepower gas engine. Toro, Black & Decker, and Sears build the recharger right into the mower, which simplifies recharging: plug the mower into the wall with an extension cord. It takes between 12 and 24 hours (overnight) to fully recharge most mowers, though a 3-hour charge will give you about 20 - 30 minutes of cutting time. Expect batteries to last about 5 - 7 years. Ask dealers about the cost of replacement battery packs; costs vary from $50 to $200 each. Batteries lose power when they're stored for a long time. To store most models during winter where temperatures fall below 40 degrees., charge the battery overnight, then disconnect the mower from the charger until the next mowing season (up to 6 months). If temperatures generally stay above 40 degrees where you live, leave the battery connected or plugged in year-round. However, check the owner's manual for specific storage directions. Manufacturers' run time numbers are only estimates. How long a machine will run depends on height and grass texture, moisture, and terrain. Cutting relatively dry lawns takes a less energy than cutting lush, wet turf. As a general rule, if amperage is equal, 12-volt batteries provide 30 - 40 minutes of mowing time; 24-volt mowers last 40 - 75 minutes; and 36-volt mowers run for up to 90 minutes. The more power required, the less time batteries last. For example, if your lawn is lush and thick, or if you let it grow tall before mowing, assume batteries will last for 4,000 - 5,000 square feet or so. If your lawn is easier to mow, many cordless electrics can handle up to 8,000 square feet of lawn. 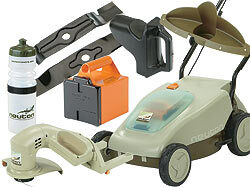 The obvious difference between batteries and corded electric mowers is the cord. While neither version are suitable for larger lawns, the corded model is limited to about 100' from a receptacle outlet (beyond this distance and voltage drops may cause a problems). You also have to be careful about running over the extension cord. To be on the very safe side, electrical outlets that you hook an electric corded mower to should have a GFI receptacle in place. This will help prevent you from being electrocuted should you accidentally run over the cord. As with cordless models, corded electric mowers are capable of effective mulching action. The prime advantages over the cordless models is that you don't have a battery that needs charging or disposing of when they reach the end of their life cycle. You're also not limited to the mowing time of your battery's charge (about 60 minutes). When you compare total costs - purchase and maintenance - the electric mowers are cheaper than the gas driven mowers of similar power, but the difference between corded and cordless is negligible. Today there are several companies producing cordless electric battery chargers. The solar panels recharge the batteries in 2 - 3 sunny days or 4 - 5 cloudy days. 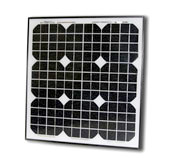 This solar panel option costs about $250. Activity and fuel consumption data for these sources are limited in comparison to transportation sources. There is no one data source that currently has information on all the non-transportation mobile sources [which includes lawn mowers], and different publications report significantly different estimates, complicating the estimation process. For instance, estimates derived from a 2004 analysis of various data sources, including FHWA, EPA, and EIA by Oak Ridge National Laboratory (ORNL), were considerably higher than estimates currently used in developing the U.S. GHG [Green House Gases] Inventory. Moreover, it is likely that the transportation and mobile sources estimates of GHG emissions in the U.S. GHG Inventory are missing emissions associated with off-road use of trucks, and these emissions may be captured under other sectors, especially the industrial sector. Cutting Path - 19 "
Cutting Heights - 1 1/2-3 1/2 "
Cutting Height: 1.5" - 3.5"
EPA has finalized a new emission control program to reduce hydrocarbon emissions from small spark-ignition engines by about 35 percent. The new exhaust emissions standards take effect in 2011 or 2012, depending on the size of the engine.